SC BIBLIOTECA CHIMIEI SA is a public library specialized in the field of Chemistry, unique both from the point of view of the volume publications stored. 46.000 volumes, general and specialized, encyclopedias, technical and bilingual dictionaries. 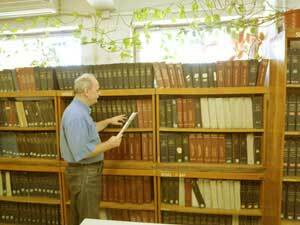 950 titles of specialized magazines, in complete collections running for 50-60 consecutive years. All these are available for study, free of charge, to students, Ph.D. candidates, professors, researchers and specialists in the field of chemistry, petrochemistry and other related fields. The modern reading room, offering free access to the shelves accommodating the collections, creates optimum conditions for study and documentation to it's readers, being open Monday to Thursday between 8 a.m. to 4 p.m. and on Friday between 8 a.m. and 1 p.m.